Recounting heroism of African American soldiers in France and requesting assistance regarding lynchings in the US. Memphis, Tenn., May 28, 1918. Benj. J. Perkins, R.B. Roberts, J. W. Robbins, W. W. Whitton, R.F. Scott Harrison Greene, M.C. Durham, B.J. Wilson, W.H. Bowers, Jno. Mebane, J.B. Whittaker. Field, J. Francis Robinson, “J. 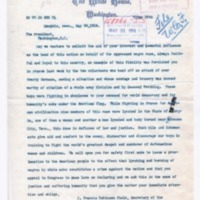 Francis Robinson Field to Woodrow Wilson,” 1918 May 28, TI00130, Race and Segregation Collection, Woodrow Wilson Presidential Library & Museum, Staunton, Virginia.